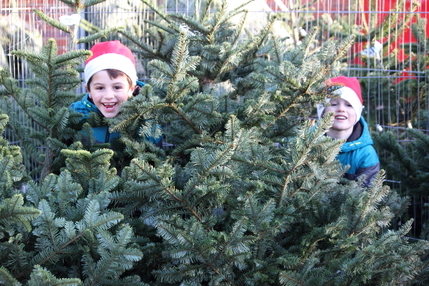 4th Ewell (Nonsuch) Scout Group is holding a sale of real Christmas trees in order to raise funds for the Group. This year is our eleventh Christmas tree sale and represents our most significant fund raising event of the year. Our Christmas tree sale takes place at our HQ on London Road, Ewell. You can choose from hundreds of premium non-﻿drop Christmas trees at our sale and you can also reserve & collect or order online for local home delivery. We have also teamed up with 3rd Bookham Scouts, if their HQ near Leatherhead is nearer for you. Yes! We offer a delivery service in the local area for a small fee for both trees purchased at our sale or ordered online. ​Can I buy a tree online? Yes! You can either reserve your tree online to collect on our sale days or you can order online for home delivery. We use a secure checkout process and take payments using credit/debit cards, PayPal and on mobile devices, Apple Pay & Android Pay. Online orders are delivered locally from our HQ in Ewell. Can you trim the stump for me? All part of the service! We're happy to trim the stump to your direction. Whether this is just to take half an inch off the bottom to help the tree draw up water, or to ensure the tree will fit perfectly in your stand (please bring with you for a made to measure fit!). If you don't have a tree stand, you can buy one at the sale. Do you open in bad weather? Yes - even in the heavy snow of 2011 we were out selling trees and keeping our car park clear for customers. Do you wrap the trees? We have a netting machine on site to assist you in the easy transportation of your tree. The trees can be wrapped in a light mesh which is easy to remove when you reach home. Care should be taken when removing the mesh so as not to damage the tree or injure yourself if the branches spring out. We do not charge extra for wrapping your tree! We can also bag your tree for £1.50 to ensure your car stays needle free on the journey home. Yes. We accept all major credit and debit cards, including Apple Pay and Google Pay contactless. Sorry, we are unable to accept cheques. We accept cash or cards. Can I buy a tree sooner for my local business or organisation? We recognise that local businesses, churches, schools and care homes often want their tree before the beginning of December. If you are looking for a tree before our official opening, please contact us with your requirements. We also offer discounts for multiple tree purchases with delivery before 1st December. How can I make sure my tree stays fresh for all of Christmas? How cheap are your Christmas trees? We regularly price check other local stores and aim to keep our prices as low as possible to make sure we're providing great value to our customers. But not all trees are equal - we only sell fresh premier quality trees as our aim is for total customer satisfaction. Our trees, with the right care will last you right through the festive period. The same could not be said for a cheap Christmas tree sold by a low price supermarket. And don't forget that when you buy from us every single penny of the money made on the sale of each tree goes to charity. Can you collect our Christmas tree in January? This is not a service we provide, however Epsom and Ewell Borough Council offer a free real Christmas tree recycling service for all residents. Real Christmas tree collections will take place on your normal collection day during week commencing 15 January and week commencing 29 January. Remove all your decorations and leave your tree in a clearly visible place next to your bins on your collection day during one of those weeks. Don't cut up your tree; it's easier for them to handle whole. ​Download our promotional materials and help us advertise the sale.